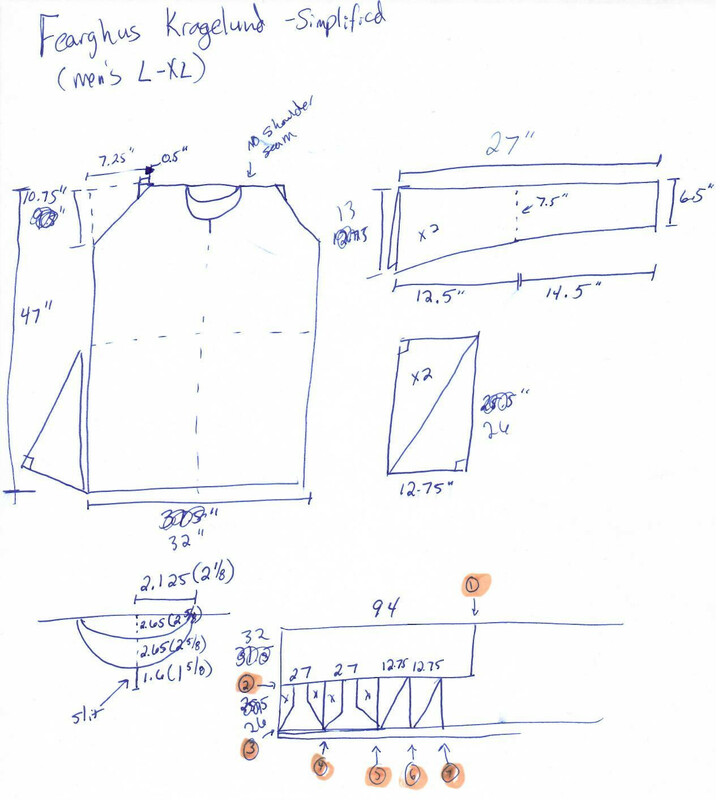 My notes about the original Kragelund tunic are saved in another post. I recommend reading that for more background information. – Tunic made of Wool found in Fattiggårdens mose near the village Kragelund, north west of Silkeborg, Denmark (also approximately 15 miles south of Viborg, Denmark) carbon dated to c.1040-1155 (which is also within ~50 years of the Viborg tunic). – Original is cut poncho style (no shoulder seams), sleeves do not use a gusset and the tunic has gores on center front, center back and each side. – I hate (hate hate hate) trying to set a gore in the middle of a piece of fabric so I’ve eliminated the CF and CB gores. It would be more correct to have those. That said, it does occur to me while staring at this that the off-cuts from the sleeve could very easily be used to create 2 more sets of gores for the center front and center back. – I prefer to have the seam connecting the body of the garment to the sleeve to actually fall at the point of the shoulder. So I nip a triangle out of the top on each side to bring that seam up off the arm. 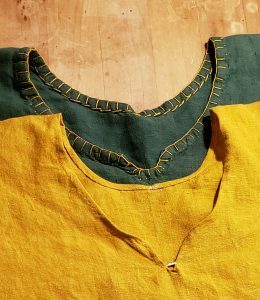 If it really bothers you, you can monkey with the length of the upper sleeve and move that into the body of the garment and eliminate the triangle. Also initially when my husband was bigger (400lbs) the triangle was necessary to keep the seam from ending up at his elbow. – I cut the sleeves as one piece of fabric rather than piecing it together as seen in the original. I am modern and have plenty of fabric. – My husband is (now slightly) bigger than the original wearer of the garment. The indicated measurements are adjusted to fit him. – I use linen. My husband has said many times that he would burst into flames if I made him wear wool in mid-summer in California. I love my husband and would not like it if he were to catch on fire. 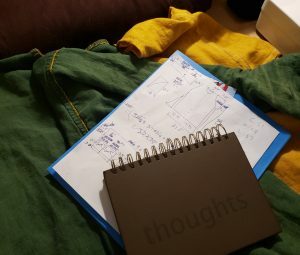 – I use machine flat-felled seams for the tunic. I have no idea what kind of seams were used on the original. I have made this using french seams but I find the results less satisfying than using flat-felled seams. I’ve included my cutting guide (since it also saves me time having to draw it up every time I make a new tunic). Follow the cutting guide (measurements in inches). Seam allowance for flat-felled seams are included in these measurements. Fold the body part length wise and then top to bottom to find the corner where the neck opening and shoulders will be. – Draw in and then cut off the triangles at the shoulder corners. – Draw in the neck opening for the front, back and slit. – Follow the back line and cut out all four pieces. – Follow the front line and cut out only the front pieces. – Continue on the front and cut in the center front slit. Fold the sleeves along their length (the 27″ measurement). Cut out the flair of the sleeves. Stack the gore rectangles one on top of the other and cut them corner to corner. – Sew the sleeves closed. – Sew the gore pieces onto the body. – Sew the side of the body/gore pieces closed. – Trim the hem to a nice rounded shape. – Add a 1/2″ folded hem to the neck opening, end of the sleeves and bottom hem. – (optional) Add a reinforcement floating button hole to the neck opening slit to prevent the slit from tearing out.